In Vishnu's fifth incarnation, he transforms himself into a vamana or dwarf. Bali, the grandson of Prahlad , was a famous demon. By leading an austere life he had acquired the power to rule the earth. Indra and the other gods feared that some day Bali would conquer everything and defeat them. So they asked Vishnu for help. Vishnu decided to be born in the household of a poor Brahmin. One day he went to Bali and asked for alms. Seeing the young boy, Bali agreed to give anything the dwarf asked for. 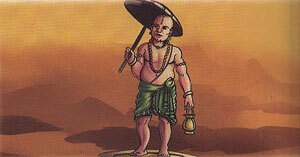 Vamana asked for the entire land that would come under three steps. Bali agreed. The dwarf then grew in size and covered the earth and heavens with two steps. Due to lack of space he placed his third feet on Bali himself. He crushed Bali and sent him to the nether world.